No, this isn't a prop from a King Kong movie — it's a newly discovered member of the Megaloptera family that could very well be the largest aquatic insect in the world. 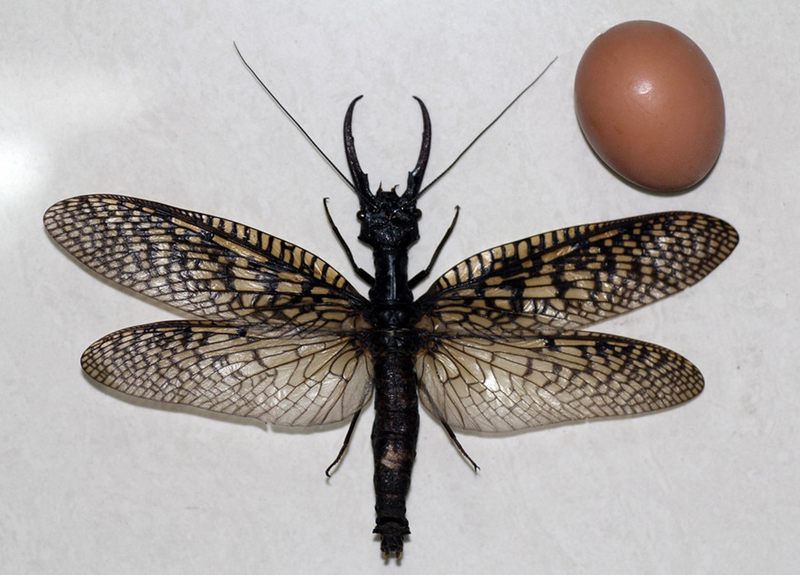 Images of the grotesquely huge bug recently appeared on China's ECNS website. The specimen was discovered in a mountain of Chengdu, Sichuan province. It's wingspan measures an impressive 8.2 inches (21 cm). Not much is known about this insect, or the Megaloptera family for that matter, but it does include about 300 described species of winged alderflies, dobsonflies, and fishflies. Just as this new find is so far pretty mysterious, members of Megaloptera are also fairly poorly known. As larvae, they spend all of their time in the water, only venturing out once it's time to pupate and become adults. While they're usually found in clean, clear streams, rivers, swamps, ponds and lakes, they're also perfectly capable of sustaining themselves in muddy and polluted water, which makes them extra hard to spot. As adults, they enjoy relatively short lifespans, and use the vast majority of this time to find mates. They end up with enormous tusk-like mandibles and mouthparts as adults, but at this point they're pretty much done eating anything at all, so the males use them to attract females and then hold them in place while they mate. Be sure to read Bec's entire article, which includes a round-up of the world's largest aquatic insects.